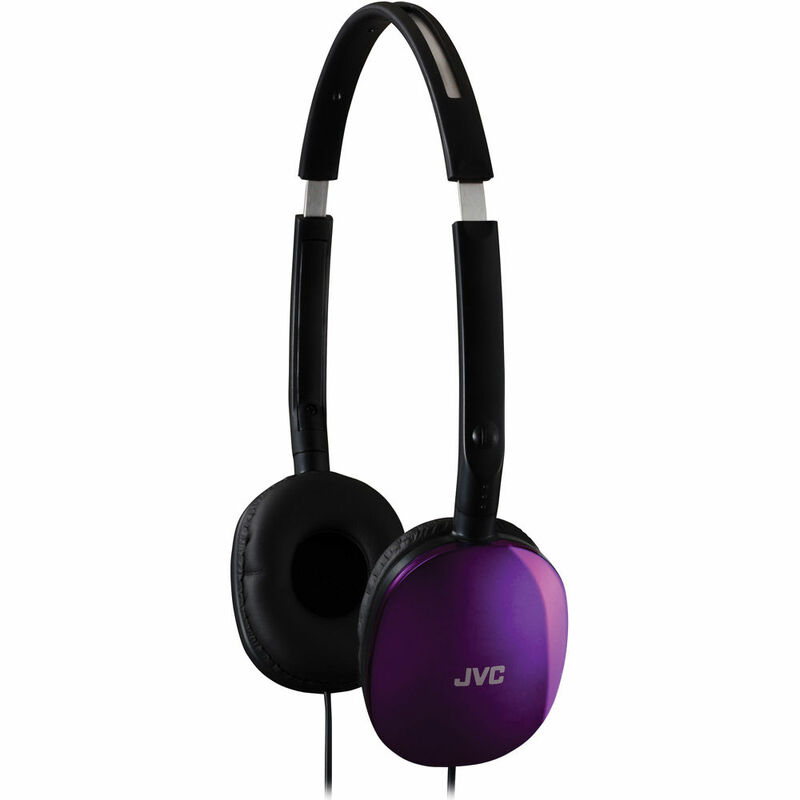 The HA-S160 FLATS On-Ear Stereo Headphones (Violet) from JVC provide high-quality audio in a lightweight and portable design. Ideal for on-the-go lifestyles, the headphones feature a fold-flat design for easy transportation and storage. Powerful 30mm neodymium drivers provide crisp, natural audio with a wide frequency response. The thin, adjustable stainless steel headband provides a snug and comfortable fit, while the soft on-ear cushions provide lasting comfort. The cushions, along with the closed-back headphone design, also block out ambient noise so you can focus on your music. The cable has a slim gold-plated 3.5mm stereo mini plug for wide compatibility with MP3 players, CD players, smartphones, laptops, and more. Box Dimensions (LxWxH) 8.1 x 5.8 x 0.6"
HA-S160 FLATS On-Ear Stereo Headphones (Violet) is rated 4.5 out of 5 by 54. Rated 5 out of 5 by Anonymous from The only ones I buy These headphones have great sound and amplification. The band isn't the sturdiest thing in the world, so this is the third pair I've bought in about five years, but I don't even care. The bass is nice but not too heavy (I can't stand heavy bass). I originally fell in love with these because my computer audio jack is screwed up and is only stereo if I plug headphones in halfway, and of course then the sound comes over the laptop speakers too. But these headphones are loud enough to hear loud and clear with the computer speakers inaudible so it doesn't bother anyone else. Not judging these based on whether they're editing headphones. I use them for listening. Rated 4 out of 5 by College Student at the Cafe from Good value headphones Considering that I got this pair for the price that I did, their sound quality is pretty good, and the padding is pretty comfortable. They're good to travel with, being lightweight and with the earpieces able to swivel so that the whole thing folds flat. They've been holding up pretty well too, especially for being carried around a lot. The only reason why they're 4 stars and not 5 is that the cord is a bit shorter than I'm used to, and though the construction is great at the moment, I don't like how thin the headband is because it feels very breakable (though it's been fine so far). Also, they're not great at blocking out outside noise. Rated 5 out of 5 by Anonymous from Excellent Headphones for the price These headphones are the best. I had a pair for four years and lost it somewhere so I bought it again. The fact that they still sell this model says something. Lightweight, super comfortable with soft vinyl earpiece sleeves, great sound, and all that. Folds flat so it can fit in a jacket pocket with your mp3 player alongside it. Hard plastic so will not break if you drop it. The only thing you could do is possible stretch the cord out of the earpiece, but that is the case with all headphones. Sounds just as good as the expensive bulky models and much better than bud earphones. Has no sound control and noise cancellation functions, although the headphones do block out noise somewhat even if you are not playing anything. Rated 5 out of 5 by J hangin' in the CA from Great headphones. Will buy a 2nd pair! I bought these headphones for work because they were cheap, low shipping (thanks B&H!) and had some decent reviews. Got them in the mail and I am very impressed. sound quality is great, and this sounds really nerdy but I am so impressed at how they fold flat without compromising the quality. I also really really appreciate the padded ear cups that are a nice balance between comfort, good sound quality and dont look like those ridiculous dj/ audiophile headphones. I've already recommended them to my friends and I'm about to buy a second pair to use at home. Rated 2 out of 5 by paikinho from Sound is fine. But wire is very very weak. These haven't held up very well. The wire inside of the cable casing is very very prone to getting broken which renders the nice speakers useless. The last pair had one speaker that quit after 2 months light use and then the other speaker quit after another week. These sound great, are nice and light, comfortable, but the skimping on robust enough wire will always mean they quit after a time. Rated 5 out of 5 by Kennis from Best deal in this style I had these headphones about two years ago. They were some of the best I've used, especially for the price. I'm pretty rough on headphones and I use them a lot, but these held up for almost two years stylen absolute record for me. It's always the jack that goes bad and I would almost swear most makers design it that way. But these held up better than any I've found, the sound is phenomenal for the price, and they fit my ears perfectly and are extremely comfortable, which is pretty important when you wear them a lot. My local stores stopped carrying them, so for convenience sake, I figured I'd just buy other brands I've used before. Either the sound,volume, bass were a real disappointment (since I'd been spoiled by the JVC flats), or they fell apart. I had one pair fall apart ( the jack, of course) in less than a week. Disgusting. But now I ordered two more pairs of these JVC flats online, and am happy as can be with them. I very highly recommend them to any serious music listener. The buds just don't cut it for me. Rated 5 out of 5 by Joseph from Excellent value cans I wasn't expecting much for $ USD but I'm amazed by the sound quality of these little cans. Thry sound significently better than the headphones they replaced - Koss Porta Pro. Bass is very solid, highs are crisp. I use them plugged into a Pioneer stereo receiver. Downsides are they're not the most comfortable and after an hour or so my ears start to fidget but nothing close to unbearable. Cord length could also be longer but I bought a 3.3 ft noodle extension cable to solve that problem. I'd buy these again. Yes. I bought 2 pair for my daughter, who keeps breaking headphones. These have worked well and survived for several months.